In the early 1980s, an ad like the above was one of the only ways Pala International (and its retail relative, The Collector Fine Jewelry) had to attract clientele. In early 2000, Richard W. Hughes debuted Pala's Palagems website, and text-based news was sent to subscribers on an as-needed basis. With the departure of Richard in 2005 and the introduction of brother David as news editor, an image-rich monthly newsletter began. Ten years later we felt it was time to craft a new look to our website and this monthly e-newsletter. Like the new website, the revamped newsletter will adapt well to mobile devices. Saying it will "open a new chapter in the worldwide jewellery industry" in terms of networking in the region, Vicenzaoro Dubai (VOD) will take place April 14–17 next year. Actually the chapter opened for the first time a year ago, with six thousand visitors from more than 110 countries attending. Twenty-five nations were represented by five hundred brands. The show targets four markets: Middle East, Eurasia, North and East Africa, and South Asia. And the show presents in four sections: Global Brands, Fine Jewellery & National Pavilions, Gemstones & Diamonds, and Packing & Supply. VOD is a organized by DV Global Link, a joint venture of the Dubai World Trade Centre and Fiera di Vicenza, which, according to its website, has its roots in a free festival first mounted in 1694 in the city of the same name in the Veneto region of northeast Italy. This month we feature an exceptional wulfenite from Namibia and an unusual zoisite from Tanzania. This wulfenite was part of an old parcel bought back in the 1970s by Bill Larson and recently cut by Brett Kosnar. The size and color of this wulfenite are quite impressive for the species. Most often seen as fine mineral specimens, wulfenite rarely gets faceted into gems. Starting from brittle thin blades, then cutting down into exceptional gems like this is no easy feat for a cutter. This one came out stunning, showing off its high dispersion. Perfect as a rough-and-cut for mineral collectors or a rare addition to any gem collection. Our other feature this month is a rare color of zoisite from the famous Merelani mines in Tanzania. Stout purple tanzanite with flashes of pink. The strong color, precision cut, and impressive size add up to one impressive specimen. In the last few years we have seen more fancy colors coming out of the Merelani deposit. A departure from the classic blues, we have see greens, yellows, pinks, and purples like this one. The fancy colors often come out of the ground with no need of heat treatment, making them much more rare than the common blue hues. Pala International is pleased to unveil a new website layout that will adapt its display to your various devices (smartphone, tablet, and laptop or desktop) and orientations (landscape, portrait). Virtually all of the content of the prior website is available to users, but the menus have been streamlined to avoid clutter. In the interest of launching this user-friendly website immediately, older articles and newsletters contain links that still point to the legacy site. Over the coming weeks and months we'll be updating that material and redirecting old web addresses to the new pages. If you find what you think is a mistake, or a link points to "Oops! ", send us the address of the page that contains your concern. We hope you'll enjoy using the new site. Earlier this month, Switzerland's SSEF and Gübelin Gem Lab agreed to harmonize their standards for the color terms "pigeon's blood red" and "royal blue," terms that have been used for centuries. Last spring, Lotus Gemology issued its own discussion of color types used in its gemstone reports. Image from SSEF and Gübelin Gem Lab joint news release. The problem was defined in a joint SSEF/Gübelin Gem Lab press release. "Pigeon's blood red" and "royal blue" historically have referred to stones of specific, saturated hues and of high quality. But, given that the terms could tend to enhance the value of stones, it has been tempting to employ them in an "inflationary" and "ambiguous" manner, absent an international standard. SSEF and Gübelin originally developed their own strict criteria independently—criteria that now have been harmonized. The criteria have two components: color and quality. You'll have to read the detailed descriptions of both (in the press release) to obtain the fine points but, briefly, color must be "intense, saturated and homogeneous" as defined by sets of masterstones held by both labs, which are essentially matching. Regarding quality, any type of treatment disqualifies them, and eye-visible or dark inclusions also are a no-no. For its part, Lotus Gemology had a demand from clients for color types beyond the binary "pigeon's blood" and "royal." Nearly four decades of experience with the stones and their history and literature have given the lab what it deems as license to, mm, pigeon-hole stones in sixteen different color types. The reds range from Pastel to Royal, the blues from Pastel to Twilight, and for good measure there's Lilac, a Pastel yellow, Padparadscha, and Mekong Whisky. Lotus cautions that a color type's appearance is affected by cut, clarity, pleochroism, and sometimes fluorescence; each color type covers a range of color; there are such colors known as "out of gamut," which can't be reproduced on screen or in print; and all colors are affected by lighting. Each of the color types is explained in detail, illustrated where appropriate with non-gemstone images (a peacock feather, a yellow Post-It note). 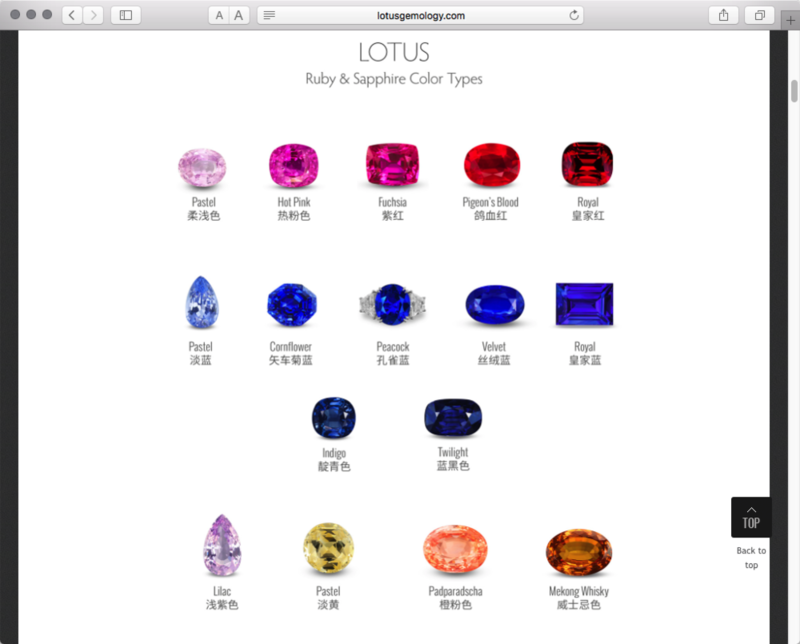 We're told that Lotus Gemology has produced a free card listing the color types as well as a 48-page hardcover book, From Peacock to Pigeon's Blood: An Introduction to Ruby & Sapphire Colors, in English and Simplified Chinese, available for US$10 in the lab's Bangkok office. In its November 12 e-newsletter, not yet archived on its website, Gübelin Gem Lab announced that it has successfully dated fine, valuable Madagascar sapphires of greater than 10 carats. By locating tiny zircon crystal inclusions that touched the stones' surface at the girdle, the zircon could be probed using the lab's Laser Ablation ICPMS facility. Because the laser spots' diameter is only 0.03 millimeters, the probe does not affect the stone's quality, weight or value. The analysis of uranium and lead isotopes provided the stones' ages of about 650 million years, which matches data in the literature for the Pan-African orogeny (lateral compression), which is when these sapphires had been figured to have formed. Thought to be the first such dating on a high-value gemstone, the lab has submitted a research paper for publication. The gemstone world lost one of its most enthusiastic champions with the death of Roger Merk on November 5. An avid collector and dealer in jade, Roger may best be known to gemstone lovers as the organizer of the Annual Sinkankas Symposium, which had covered a total of thirteen topics on individual stones and gemstone groups. In August, we remembered the life of gem dealer and beneficent gadfly Dana Schorr, who passed away suddenly on the 5th. On October 22, the times of Dana Schorr were recalled by his friends Don Boekelheide and Karen Madsen Zwicke in the pages of the Santa Barbara Independent. But for these reminiscences, who in the world of gemstones would know that Dana once unionized his radical print shop with the Industrial Workers of the World? (IWW icon Joe Hill, whose songs have influenced musicians from Bob Dylan and Joan Baez to Ani DiFranco and Ry Cooder, was executed one hundred years ago this month. A musical play about Hill tours Denver this Friday.) It was Dana's organizing acumen, which he exercised beginning in the early 1970s, that he would employ later, after being bitten by the gemstone bug at the Tucson Show in 1980. A second, uncredited, obituary for Dana Schorr also appeared in the Independent. In October, Southern Jewelry News published an interview with Gary Roskin, who has taken over the reins of the International Colored Gemstone Association (ICA). In the interview, Roskin discusses gemstone promotion, ICA's headquarters location, communication improvements, ethical standards, amongst other issues. Challenges to the industry that Roskin will be dealing with include gem treatments and origins ("color and country"), laboratory harmonization, broadening the audience of ICA's flagship publication InColor, and tools for the retailer. All I want for Christmas is my two record-setting-fancy-colored-diamonds-preferably-at-under-the-pre-sale-estimate… We have no idea whether Josephine Lau celebrates Christmas, but if she does, there will be a couple of big gifts in small packages under the tree this season. On Tuesday at Christie's Geneva, Josephine's father, Hong Kong business tycoon Joseph Lau, bought a cushion-shaped fancy vivid pink diamond weighing 16.08 carats. "The Pink," as it was known prior to the sale, immediately was renamed "The Sweet Josephine." At US$28,523,925 (a million and a half above the pre-sale estimate), it set a world record for a fancy vivid pink diamond sold at auction. It is the largest cushion-shaped fancy vivid pink diamond ever to be offered at auction. Christie's told The Guardian that The Pink was one of only three such certified diamonds to be offered for sale in 250 years. This video explains how "The Blue Moon of Josephine" was cut, and why its color is so unique. A day later, at Sotheby's also in Geneva, Lau bought the "Blue Moon Diamond," which we looked at last month. At 12.03 carats, it is the largest cushion-shaped fancy vivid blue diamond ever to appear at auction. It sold for US$48,468,158 and was renamed "The Blue Moon of Josephine" by Lau. Even though it sold for well within its resale estimate of US$35–55 million, it set a new world auction record for any diamond of any color—or any gemstone, for that matter. Lau has a backstory almost as noteworthy as the Blue Moon, which was cut from a whopping 29.62 of rough; Lau was convicted of bribery and money laundering in 2014 and sentenced to five years in jail by a Macau court, according to BBC. Since Hong Kong and Macau have no extradition treaty, Lau remains free as long as he doesn't visit the territory. Forget the Kimberly Process. Now you'll be able to obtain diamonds for which the source is not in question. After three years of research, Diamond Foundry, a Santa Clara, California startup, has devised a way of growing "real" diamonds in a lab. The company has attracted high-profile Silicon Valley financing; even Leonard DiCaprio, who starred in the 2006 film Blood Diamond, is on board as an investor, according to a story last Wednesday in Business Insider. Diamond Foundry's process involves using a small slice of natural diamond as a seed upon which layer after layer of diamond are grown. After growing—up to 9 carats so far—the seed is cut off to be used again. The diamonds are cultured in a reactor that reaches about 8,000 degrees Fahrenheit, and the grow period is relatively short—about two weeks. These cultured diamonds contain the same molecular imperfections of natural diamonds, setting them apart from traditional synthetics. And unlike synthetics, which tend to be cheaper than natural, cultured diamonds will cost the same or more. The big news in Burma this month is the victory of Aung San Suu Kyi's National League for Democracy party, which defeated the political arm of the nation's military, the Union Solidarity and Development Party. By law the military retains a twenty-five percent bloc in the upper and lower legislative houses—enough to prevent changes to the constitution, which still gives the military power over key security elements. Nevertheless, Suu Kyi, who (as the mother of children holding foreign passports) is barred by that constitution from becoming president, boldly told the press on November 5, three days before the election, "If we win and the NLD forms a government I will be above the president. It's a very simple message." On the 10th, she told BBC, "Well, I'll make all the decisions. It's as simple as all that. If I'm required to field a president who meets the requirements of Section 59(f) of the Constitution, alright, we find one. But that won't stop me from making all the decisions, as the leader of the winning party." When asked whether that might make the generals nervous, she said she believes in transparency. For a fairly gloomy forecast of Suu Kyi's and Burma's prospects, see "Still the generals' election" by The Economist. More cold water was thrown on Burma's moment in the sun when human rights NGO Global Witness published a report October 23 that reflected on the moment, with pessimism. Acknowledging "real change" in some areas, the report states that "in other critical areas, the reformist narrative bears little scrutiny. Nowhere is this truer than in the jade sector." The group spent more than a year in its scrutiny of control of an industry that "is tightly controlled by the same military elites, US-sanctioned drug lords and crony companies that the government says it is consigning to the past." The report claims that former dictator Than Shwe and others are skimming the cream off Burma's most valuable resource. "As the country approaches an historic election, the importance of these findings to Myanmar’s future is hard to overstate. Our investigations show that the elites who between them have most to lose from an open and fair future also have ready access to a vast slush fund in the shape of the jade sector." The report is called "Jade: Myanmar's 'Big State Secret'"—a secret that was well kept (at least to some) before Global Witness drew upon new research and analysis. The NGO figures "that the value of official jade production in 2014 alone was well over the US$12 billion indicated by Chinese import data, and appears likely to have been as much as US$31 billion." That translates to nearly fifty percent of the country's official gross domestic product. The report criticizes the way in which value is extracted from Kachin State, whose people "are seeing their livelihoods disappear and their landscape shattered by the intensifying scramble for their most prized asset. Conditions in jade mines are often fatally dangerous, while those who stand in the way of the guns and machines face land grabs, intimidation and violence." Global Witness makes twenty-seven recommendations to the government of Burma; to donor governments, international financial institutions, and other government partners; to the Kachin Independence Army/Kachin Independence Organization; to jade mining and trading companies; and to current or prospective international investors. The suggestions include greater transparency along the lines of the Extractive Industries Transparency Initiative (which we looked at two years ago), compliance with international law, ban the military/security from involvement in mining, integration of Kachin State in ownership and revenue sharing, and a host of others. But also recommended is the maintenance of U.S. sanctions. See an online overview of the 128-page report here. On the 30th, Kanbawza (KBZ) Group, a conglomerate that has its roots in jade, was cited in a Myanmar Times story as having cooperated with Global Witness during its year-long investigation. "While the company's commitment to greater transparency is laudable, its relationship with the jade business remains opaque," the GW report stated. KBZ Bank is Burma's biggest private bank, as noted in an October 31 Irrawaddy story. In other jade news, Myanmar Times on October 28 quoted Mandalay jade traders as saying this year could be the worst ever for business. Chinese buyers have been staying away in droves, perhaps waiting for the election's results. Another reason given is the new rule requiring deposits to insure that transactions made will be transactions completed. (A slowdown in foreign investment, while anticipated during this election year, did not materialize, per a government official.) This downturn, which began last year, flies in the face of Global Witness's US$31 billion estimate for the jade trade, calling that figure into question. On November 4, The Irrawaddy posted a story stating that at least 100,000 internal migrants work Kachin's jade mines—and are thus disenfranchised since they could not return to their homes to vote in Burma's historic election. Migrants were required to live in Hpakant for 180 days prior to registering to vote there. One jade miner who had been there for two years, but only goes into Hpakant twice a month, was unable to vote due to constraints on his time. A new film, which debuted October 16, profiles the challenges that people in jade-rich Kachin State. Dams, Drugs and Democracy: The Struggle for Resources in Kachin State, Myanmar follows three parties affected by the damming of the Ayeyarwady River, which was halted by President U Thein Sein in 2011. One audience member from Kachin, quoted by Myanmar Times on October 19, said that the issue is a direct reflection of the problems raised by jade mining. The one-year project took four times that long to complete, in part because of the complexity of the subject; besides the dam, the film deals with the Kachin insurgency, the region's natural resources (including jade), and the rise in drug addiction. Drug addiction is the precursor to one story in a new literary anthology produced by the British Council, according to Myanmar Times on October 16. "String Bridge" is by Kachin author Ma Li Khu Shin Ni, who went to Hpakant to teach recovering addicts martial arts. The writer's story depicts the lives of jade miners, and accompanies more than two dozen other short stories in the anthology Hidden Words, Hidden Worlds, devoted to work by authors writing in Burma's ethnic languages. The English translation will be published next year in the UK. On this episode of DVB's 'Doh Pyay Doh Myay' [Our Land Our Region] Roadshow, published on March 27, the team tours the mines of Hpakant. Hpakant's grim hills conceal the world's largest known deposits of jade. Local efforts in Kachin to fight drug addiction had a breakthrough, as reported by The Irrawaddy on October 24. Confounded as to how substances made their way in under the noses of officials, they performed a citizen's arrest on a drug-dealing woman who kept track of her expenses—$500,000 in payoffs to local authorities. In this, the last of our three-part series on the Russian imperial jewels after the 1917 revolution, we find the Soviet government continuing to sell off a parcel or two of the jewels in its holdings, with several million dollars' worth being sent to Berlin in late 1926, and a London sale by Christie's in early 1927. It seems the Soviets were unable to obtain favorable lines of credit, with only Germany stepping in. Trotsky had wanted to tax the "peasantry" and Stalin wanted foreign loans. We would know Trotsky's fate soon enough. As early as 1921, Russia had placed in hock millions of rubles' worth of jewels with Poland for an outstanding debt. But Russia was unable to pay when the note came due in 1939. A year earlier, in 1920, the Soviets had pawned at least $20,000 worth of jewels with the fledgling Irish Republic, demanding repayment of its loan in the late 1940s. Years went by with no mention of the jewels, until they were put on permanent display in the Kremlin in 1967. Some of them took a road trip to the Metropolitan Museum of Art in 1979 and the Corcoran Gallery in 1997.